Place the milk, sugar and the flour in a saucepan over very low heat. Whisk them all together until the sugar and corn flour have dissolved into the milk, then add the orange extract. Continue stirring the mixture over low heat for a few minutes. Raise the heat a bit and slowly bring the mixture just to the simmer. When it gets hot enough, the mixture will thicken. When the mixture is thick and smooth. Remove it from the heat and let it cool for just a minute or two, then pour it into serving bowls. Let everything cool for a good ten minutes or more, then place in the fridge to chill until your biancomangiare is quite thick and perfectly cold. 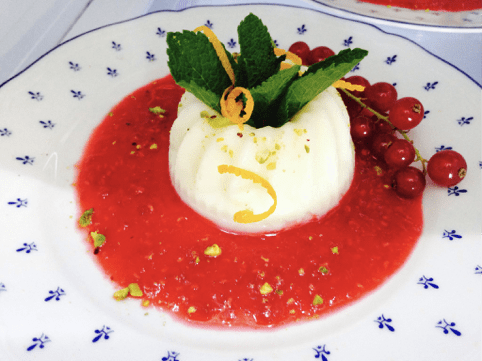 To serve your biancomangiare: unmold onto plates (if using a mold), and top with pistachio, raspberry coulis, lemon zest and a bit of mint. Serve cold.